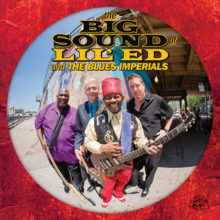 In Chicago, a city overflowing with unrivaled blues talent, world-renowned Lil’ Ed & The Blues Imperials have been standing tall for over 30 years –an extraordinary feat for any group. The band’s big sound, fueled by Lil’ Ed’s gloriously rollicking slide work and deep blues string bending, along with his rough-edged, soulful vocals, is as real and hard-hitting as Chicago blues gets. Read Lil’ Ed & The Blues Imperials’ BIO. See them near you on TOUR. Electrifying, raucous, pure Chicago blues… Lil’ Ed is a guitarist extraordinaire… slashing slide and flamboyant stage persona. Rough and ready blues played with unmitigated intensity… Swirling, snarling, riveting slide… The Blues Imperials pound out riffs and rhythms like they’re overdosing on boogie juice. Scorching and soulful, joyous and stomping. Hard-driving, house-rocking Chicago blues… raucous, blistering, gut-bucket slide. It rocks and rattles and hums… a great performance. Hard-driving… raw-edged exuberance and considerable emotional complexity. His slide can make his guitar scream like an outraged panther, moan like a hell-bound soul in torment and act the fool like a trickster, often over the course of a single song. His single string work combines post-B.B. string-bending with a raw, focused intensity. Lil’ Ed is a blues roots man and both traditionalists and contemporary-minded blues lovers with big ears should savor what’s here. Outrageous Chicago blues slide-guitar… Piping hot energy… forceful… A star of the first magnitude. What’s not to like about the raucous sound of Chicago slide guitar maestro Ed Williams and his long serving trio? Great music that often seems spontaneous will have you bopping like crazy. Superlative guitar and piercing slow-burn slide will surely gain your immediate attention. Enthusiastic and passionate.